Has the expiration date run out on Ed Markey? That’s for voters to decide, not for any would-be senator eager to convince him not to seek another term. If you could read Markey’s mind, it would be telling you that US Representatives Seth Moulton and Joe Kennedy III are letting him know — or at least think — they are with him in 2020. The same is true of Boston Mayor Marty Walsh. Still, after 42 years in Washington, the junior senator from Massachusetts must know what politicians say is not always what they end up doing. In the interests of turf protection, Markey put out early word he has no plans to step aside. “I’m going to run for reelection in 2020,” he reconfirmed over a recent lunch at the Parker House. Why? “I believe you have to fight for the future. That nothing is guaranteed. Nothing is given automatically, especially in the Trump era,” said Markey. He was talking about policies he wants for the country, but he could have been talking about his own prospects for reelection. Markey’s longevity is running up against ambitious colleagues and voters restless for change, mirroring the push for youth and diversity now affecting Democrats. Moulton, 40, who led the so-far unsuccessful effort to stop Nancy Pelosi from taking over as House speaker, is also eyed as a potential Markey primary challenger. There’s speculation, too, that Kennedy, 38, wouldn’t be sad if Markey decided it’s time to retire. That would leave an open seat and a party establishment happy to hand it off to Kennedy. Democrats like Walsh, 51, and Attorney General Maura Healey, 47, could also be interested in a Senate run. A desire to grab the torch rather than wait for it to be passed should not shock Markey. 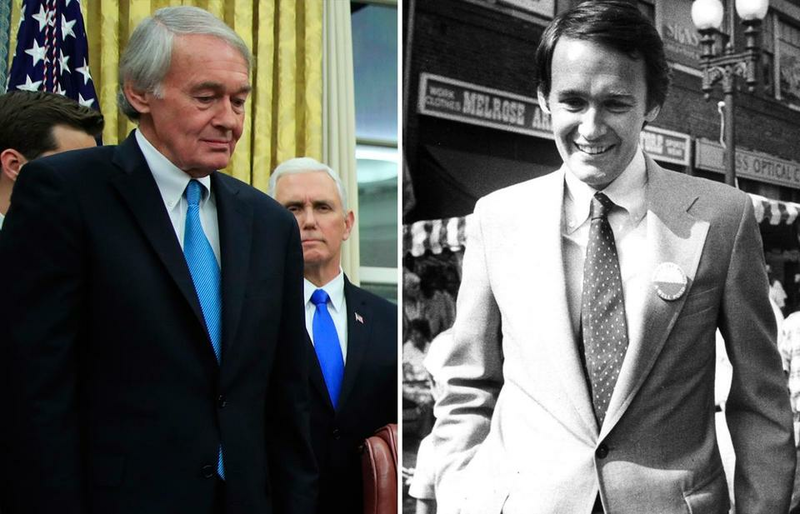 After all, he was a third-year law student when he targeted an incumbent state lawmaker back in 1973 and beat him with the slogan “A Chance for Change.” Once he got to Beacon Hill, Markey won passage of a bill to eliminate part-time district court judgeships, a cherished patronage haven. To punish him, House Speaker Thomas McGee of Lynn moved Markey’s desk out into the hall. Markey put the incident to good use when he seized opportunity and jumped into a congressional race. “They may tell me where to sit, but nobody tells me where to stand,” he declared in a famous television commercial that helped send him to Washington, at age 30. A Harvard Crimson profile on the new congressman heralded him as “the milkman’s son who broke the rules.” Today, that youthful rebel is a 72-year-old incumbent. Markey served in the House until 2013, when he won a special election to replace Senator John Kerry, who left to become secretary of state. In 2014, Markey was elected to a full six-year Senate term. Of course, Markey doesn’t see himself as old and dated. He weighs 184 pounds, the same as when he was first elected to Congress in 1976; his longish hair is a relic from that era, too. Focusing on energy and telecommunications, he considers himself part of a long-running change agenda. He’s also a champion of fighting climate change, and just announced upcoming hearings in Washington on a clean energy bill. He’s a fierce critic of President Trump. Yet, he also found a way to stake out some common ground. Last January in the Oval Office, after Republican Senator Rob Portman of Ohio shouted out, “It’s Eddie Markey’s bill,” Trump handed Markey the pen he used to sign legislation that provides funding for fentanyl detection devices. Markey’s at a point that happens to anyone lucky enough to labor in a job they love past middle age. Younger colleagues start checking your pulse and measuring your work output. But the voters are Markey’s boss. If someone wants to run against him, then run. He shouldn’t be railroaded out of his seat by someone who wants an easier path to power.